These maps show the changing medieval borders of the states found on the Iberia peninsula. 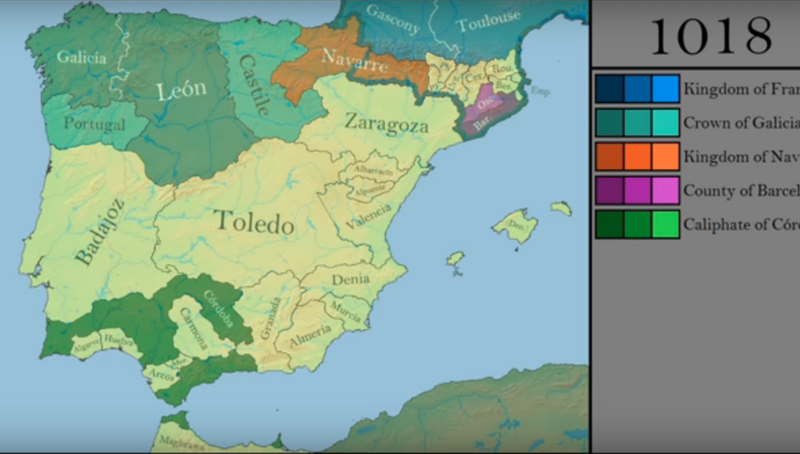 Two videos come from the Youtuber Ollie Bye – the first is a year by year look at the changing borders from ancient times to present, including the eras of the Visigothic Kingdom, the Taifa States, and the development of Spain and Portugal. The second video is more specific to the Middle Ages, showing the Reconquista period – from the year 700 to 1492, when parts of Iberia were ruled by Muslim dynasties. The Youtuber Munawat has also created a map of the rise and fall of Al-Andalus between the years 707 and 1492. The map is somewhat simpler, but offer a clear guide to to division between Christian and Islamic territories in the Middle Ages.